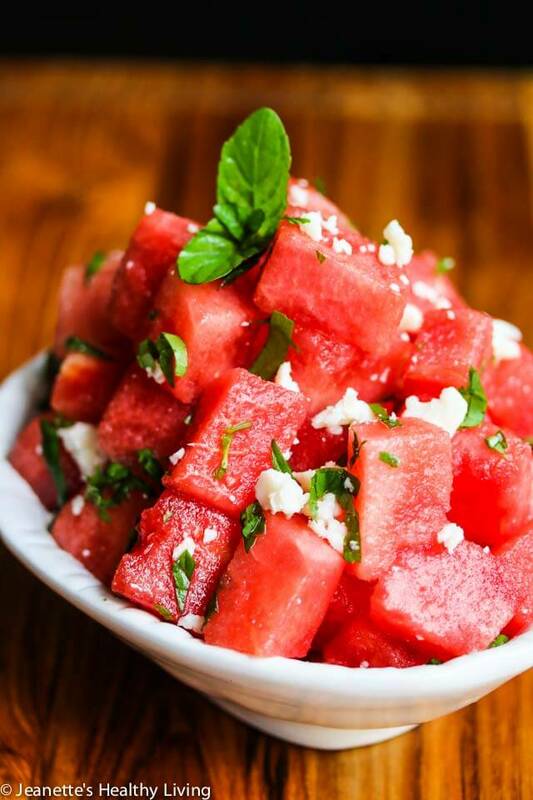 Watermelon Mint Aged Goat Cheese is the perfect Summer salad that balances sweet and salty flavors. Every summer we look forward to all the watermelon that pops up in the supermarket. 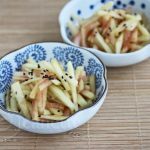 Although we mostly eat it as sliced wedges or in Watermelon Mint Freezes, I start to look for more interesting ways to enjoy this juicy, crunchy fruit that’s full of vitamin A and vitamin C as the summer goes on. 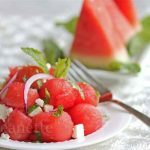 This sweet and savory Watermelon Mint Aged Goat Cheese Salad takes full advantage of summer watermelon and all the fresh mint that’s overflowing in my patio containers. 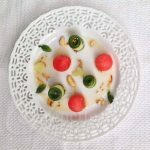 This watermelon salad is similar to the Greek Watermelon Feta Salad I made a few summers ago except I used Sartori’s Extra Aged Goat Cheese. 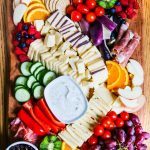 Not at all like creamy goat cheese you typically find these days, aged goat cheese is a semi-hard cheese that’s a little tangy and full of flavor. Whereas feta cheese is salty and briny, aged goat cheese has a more complex flavor profile. 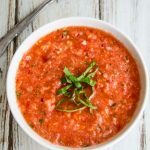 I love both versions – they both compliment watermelon nicely in a salad. Thanks Liz! 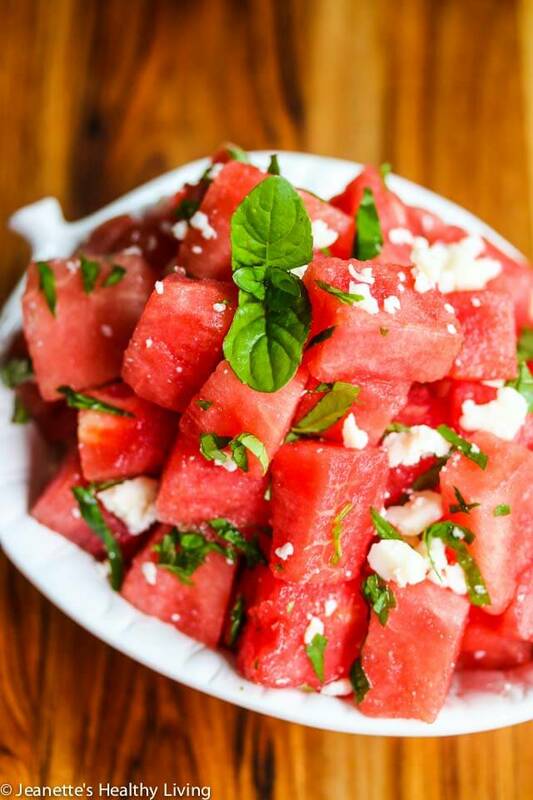 I love feta cheese with watermelon too. Always fun to mix things up with all the watermelon available this time of year. I can eat this salad the whole summer season. Wish the watermelon we have over here could have been juicier and sweeter. Me too Angie – we eat a lot of watermelon during the summer! 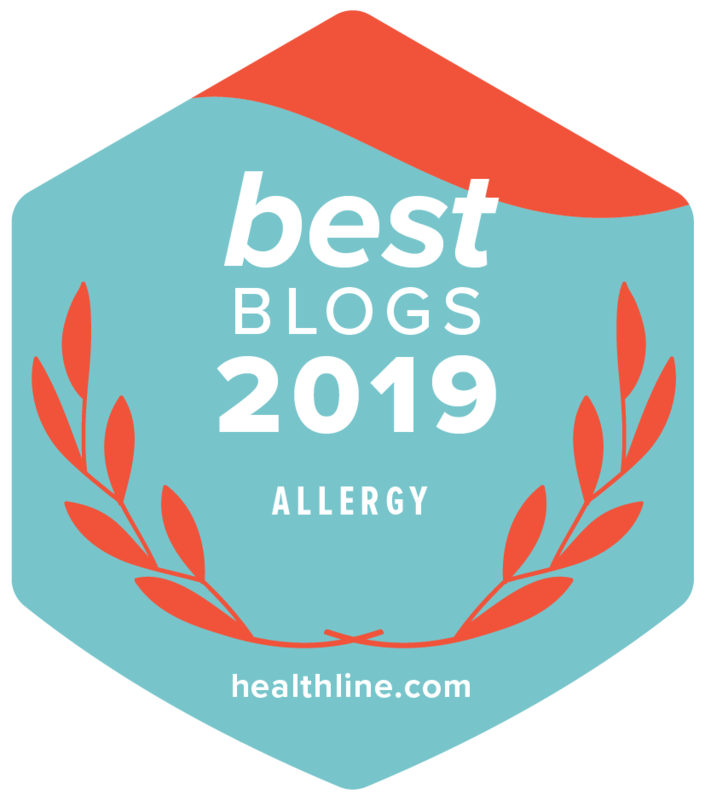 I heard that mint and watermelon together was amazing! I bet it tastes amazing with the goat cheese too! 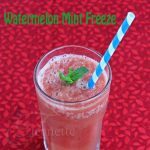 Mint and watermelon do have a natural affinity. 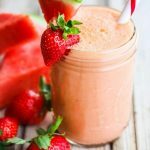 I love just blending watermelon and mint together into a frozen drink for my kids during the summer. 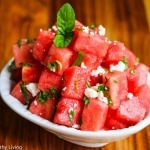 This salad adds a little saltiness to the watermelon-mint combination. Jeantte! I LOVE watermelon salads!!! I just made one the other day . . love!!!! 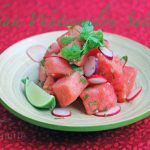 Watermelon salad are so good aren’t they – so refreshing! We can’t get enough of watermelon once it gets warmer. 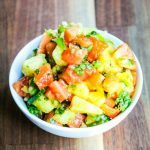 Love how refreshing and simple this salad is. I could eat this all summer long! Like Liz I have made watermelon feta salad, but not yet tried goat cheese. Looks so refreshing! 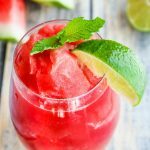 Nothing is more refreshing on a hot summer day than cold watermelon. Love this salad!